Hey guys! What’s up! Are you looking to collect some information regarding the GNM college in Chandigarh? The article will provide you complete information regarding your search. Universal group of institutions is one of the best GNM colleges in Chandigarh Punjab which provides conceptual knowledge regarding the course content along with the practical concepts. GNM is defined as General Nursing and Midwifery through which a student can set their career in the field of nursing in various departments either of public or private sectors. The university has included this course in order to serve best nurses to society. They get trained under the guidance of experts who are having experience of more than a decade. They deliver the content by keeping the current era in mind and various practical sessions are also get organized in order to demonstrate the concept practically. 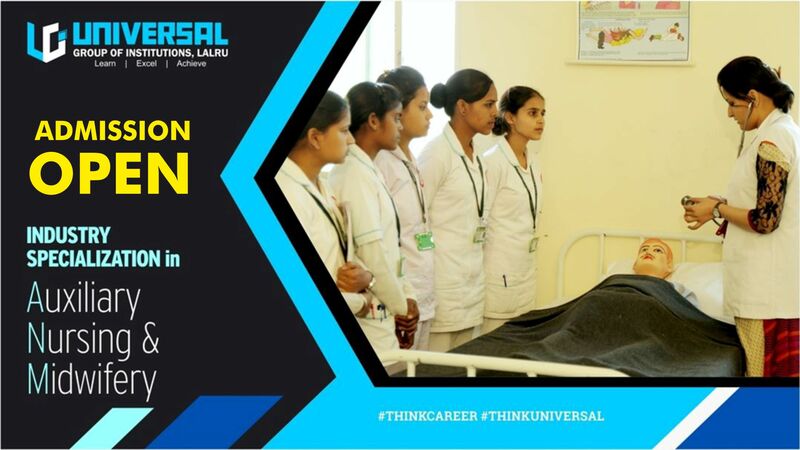 Hence if you are also in one of those who wishes to have a career in the field of nursing then Universal group of Institutions is one of the best GNM Colleges in Chandigarh Punjab and all necessary details are available at heir website. You only need to leave your name and number and our team will follow you in the shortest frame of time. The way, the institution has delivered the result, has given a new horizon to the nursing world. Students from the different part of India are getting admitted here and lots of them are settled at good positions in various organizations. Now the question which always strikes on mind is about the job opportunities after the course of nursing. Here we want to tell you that nursing is one of the demanding courses. Post completion of the course a student will be eligible to apply in various hospitals and medical centers. Our expert staffs will keep you updated for the same at regular interval so that you can prepare yourself accordingly. Universal Group of Institutions has well-equipped laboratory with advanced tools. Through these tools, one can an idea about working methodologies of the industries. The institution always focuses on moving ahead with technology and this is the reason for being called as a reputed GNM College in Chandigarh Punjab. Nursing is something which deals with serving of humanity and we prepare individual by keeping the basics in mind so that they could serve the nation in a better way. The number of students for GNM course is increasing rapidly year by year and from here we get motivated to provide quality content to an individual so that they could do best in their life. The success of the institution is directly proportional to the success of students and we always put our focus in grooming the talent in an extraordinary way and this practice has given us the desired results. Hence if you are browsing for the GNM college in Chandigarh Punjab then click at the domain of Universal Group of institutions once and see if the facilities are as per your need. Also, a consultation will be there hence feel free to contact them in any regard. Students who have passed class 12th from any recognized board are eligible for admission in the course of GNM. It is independent of the branch type. You can be either from Medical or Non-Medical. So just focus to get good marks in order to get the scholarships. The duration of the GNM that is General Life and Midwifery is of 3.5 years. In this duration, six months internship will also be provided and post that student will have the degree of GNM in hand and he or she will be eligible to apply for a job. So guys cheer up!!! Lots of openings are waiting for you. Start your journey under the roof of the universal group of institution which is a well-known name in the field of GNM College in Chandigarh Punjab. Apart from that, all other graduation and under graduation courses are being provided by the management. All details are available at the website of the college. Check out all the details at a single click and please do not hesitate in contacting us. We will be willing to see you soon. All the best with your search.